What do I need to know about Nick Miller? First and foremost, Nick is not going to try to tell you things about himself that are untrue or misleading in order to make himself (or this company) appear to be something that it is not. Nick is a straight-shooter and believes that honesty and integrity trump every other character trait – that one should own up to the truth and “let the chips fall where they may”. What education and expertise does Nick have? has met the stringent educational requirements of the State of Texas to earn a Real Estate Broker license (2009) as well as Real Estate Salesperson license (2007). Nick has been a continuous learner his whole life and expects to continue studying, learning, and growing in various business and technical adventures. What kind of business experience does Nick have? Nick has worked and excelled in various capacities throughout his life both technical and business related. He has worked as programmer, manager, consultant, process improvement expert, entrepreneur, as well as real estate sales. With his first entrepreneurial adventure was engaged with product & service development, sales & marketing, and manufacturing, and holds a US Patent (6,095,736). More significantly, is a father and faithful husband and has been engaged in volunteer activities much of his life such as performance, teaching, and leadership. Can I trust him with my business? YES! Throughout his life Nick has held various positions of responsibility that require honesty, integrity, keeping confidences, and assisting with other people’s livelihood. Nick is hard-working , persistent, and determined and has demonstrated his ability to faithfully serve many causes, including meeting the needs of real estate clients. Nick believes in keeping his word and accepting responsibility if failure happens. Nick has been faithfully married for 38 years to the “wife of his youth”. Nick also held government issued security clearances for many years of his professional life. You can trust Nick with your confidences! Will Nick listen to me and meet my needs? Nick comes to the real estate industry as a consumer first, then as a professional. He has purchased homes as well as owned and managed rental properties. 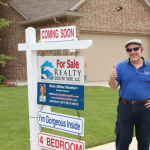 He entered the Real Estate profession while he was considering “flipping” homes – he believed that he needed a better understanding of the industry. Through this educational process Nick discovered a real desire to engage and be involved with real estate clientelle as well as real estate agency and transaction. It has been a great journey! Nick earned his Salesperson license in 2007 and Broker’s license in 2009 and since that time has also achieved the following certifications and designations: GRI, ABR, MRP, BPOR,Green, SFR. 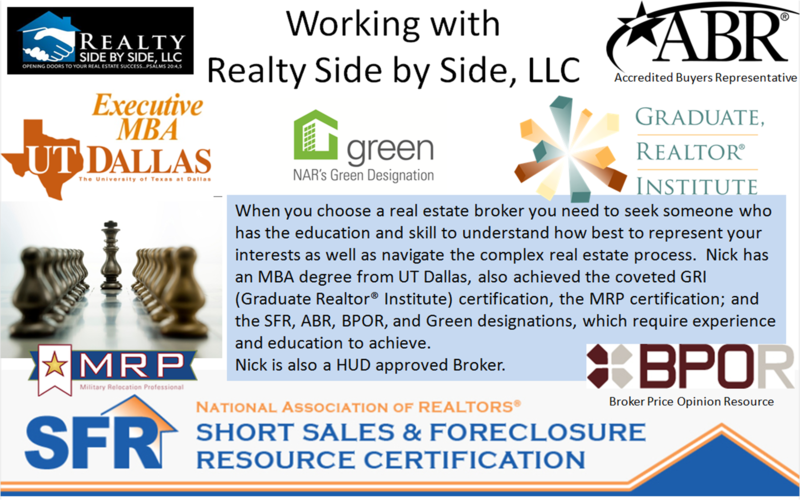 (GRI – Graduate Realtor® Institute; ABR – Accredited Buyer’s Representative; Green – Energy Efficiency, Sustainability; etc. 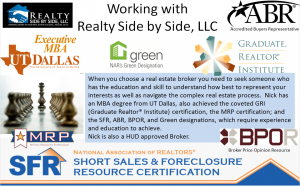 ; SFR – Short Sale and Foreclosure Resource; MRP – Military Relocation Professional; BPOR – Brokers Price Opinion Resource), TAHS (Texas Affordable Housing Specialist), VLB (Veterans Land Board). Nick has also engaged in valuing commercial property; utilizing tools learned during his MBA education as well as other key real estate training & techniques. Nick has also engaged in commercial real estate training and transactions. It would be disingenuous to give a bio of myself and not include my world view – I have a deep faith in the God of the Bible (and HIS son Jesus Christ) and believe that God is sovereign in the affairs of men. For this reason I often pray for and with my clients; I seek God’s guidance on a daily basis concerning my clients needs and the properties they seek or wish to sell; and I trust HIM to lead us and to bring success. This is the reason that I’ve chosen the tag line “Opening Doors to Your Real Estate Success…Psalms 20:4, 5”. Come join me in your next real estate adventure and we will pray-for you and I will do my best to bring you success!